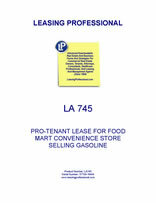 This lease has been drafted for the tenant operating a food mart convenience store outlet that also sells gasoline. The form contains extensive verbiage dealing with environmental liability relating to the storage and sale of gasoline and with the tenant's petroleum equipment. The form also contains numerous pro-tenant features, including several renewal options, the right to "go dark" (i.e., cease operations with continued payment of rent), a "no competition" clause restricting the landlord's right to lease property to another convenience store within one mile of the premises, a right of first refusal to purchase the premises in the event of a third party offer during the lease term, and a tenant right of substitution which gives the tenant the right to request a new location from the landlord after the beginning of the fifth year of the term. THIS LEASE AGREEMENT (the “Lease”) is made and entered into as of this day of , 20__, by and between COMMERCIAL PROPERTY OWNER, a _________ limited partnership (the “Landlord”), and FOOD MART WITH GAS, INC., a _________ corporation with offices in _________, __________ (the “Tenant”). 1. PREMISES. In consideration of the rents, terms, covenants, and agreements set forth in this Lease to be paid, kept, and performed, Landlord grants, demises, and lets to Tenant, and Tenant hereby takes, rents, and leases from Landlord, on the terms, covenants, provisions, and agreements provided in this Lease, the Premises (as hereinafter defined). See Exhibit A attached hereto and incorporated herein by reference. 2. TERM. The term of this Lease (the “Base Term”) shall commence on the date Landlord acquires fee simple title to the Premises (the “Effective Date”) and shall expire on the day that is fifteen (15) years thereafter, provided, however, if the Effective Date is not the first day of a calendar month, the Base Term shall expire on the last day of the month in which the expiration of the Base Term occurs. The Base Term, together with any properly exercised Renewal Term (as defined herein) shall be collectively referred to as the “Term.” A “Lease Year” shall be a period of twelve (12) consecutive calendar months beginning on the Effective Date and each anniversary thereof; provided, however, the first Lease Year shall include the period from the Effective Date to the first day of the next following calendar month after the Effective Date. Landlord and Tenant agree to execute and deliver to the other a date agreement memorializing the Effective Date, the expiration date of the Base Term, and the commencement and expiration dates of the Renewal Terms. 3. RENEWAL OPTION. Provided and upon the condition that Tenant shall not then be in default under the terms of this Lease beyond any applicable grace or cure period, this Lease shall be automatically renewed for six (6) additional five (5) year periods without action on the part of either party hereto. In the event Tenant does not desire to renew this Lease for any of the six (6) five (5) year Renewal Terms, Tenant shall notify Landlord of its intention not to renew this Lease at least one hundred eighty (180) days prior to the termination of the then current Lease period, and in the event such notification is not given by Tenant, this Lease shall be automatically extended as above provided. References to the Term of this Lease shall include extensions, if any. Except as otherwise expressly stated herein, the terms and conditions of this Lease shall remain in effect during any extension of the Term of this Lease. 4. RENTAL. Tenant shall pay Rent (sometimes “rent”) to Landlord as set forth below. Rent shall be calculated on an annual basis and shall be payable in advance in equal monthly installments on or before the first day of each month. Rent shall be paid via electronic transfer of funds (via ACH transfer or wire transfer), or at Landlord’s option (upon thirty (30) days advance written notice to Tenant), by check sent by ordinary first class mail to Landlord at _________________ or at such other address as Landlord may designate in writing from time to time. (i) Commencing on the Effective Date, the annual rent during the first five (5) Lease Years of the Base Term shall be $ payable in monthly installments of $ . For purposes of clarification, an example of calculating “percentage increase,” is as follows: For any given adjustment period, assume that the CPI in effect on the earlier date is 150 and the CPI in effect on the later date is 160. In such case, the “percentage increase” would be 6.67% [i.e., (160 – 150) ÷ 150 = 0.0667 (or 6.67%)]. (iii) For Lease Years eleven (11) through fifteen (15), the annual rent shall be increased by (but in no event shall the rent decrease) the lesser of (A) an amount equal to the annual rent payable in the tenth (10 th ) Lease Year multiplied by 0.065 (i.e., increased by 6.5%), or (B) an amount equal to the annual rent payable in the tenth (10 th ) Lease Year multiplied by the percentage increase in the CPI from the period beginning on the date which is three (3) months prior to the first day of the sixth (6 th ) Lease Year and ending three (3) months prior to the end of the tenth (10 th ) Lease Year. (i) The annual rent during the first (1st) Renewal Term, which comprises Lease Years sixteen (16) through twenty (20), shall be increased by (but in no event shall the rent decrease) the lesser of (A) an amount equal to the annual rent payable in the fifteenth (15th) Lease Year multiplied by 0.065 (i.e., increased by 6.5%), or (B) an amount equal to the annual rent payable in the fifteenth (15th) Lease Year multiplied by the percentage increase in the CPI from the period beginning on the date which is three (3) months prior to the first day of the eleventh (11 th ) Lease Year and ending three (3) months prior to the end of the fifteenth (15 th ) Lease Year. (ii) The annual rent during the second (2nd) Renewal Term, which comprises Lease Years twenty-one (21) through twenty-five (25), shall be increased by (but in no event shall the rent decrease) the lesser of (A) an amount equal to the annual rent payable in the twentieth (20th) Lease Year multiplied by 0.065 (i.e., increased by 6.5%), or (B) an amount equal to the annual rent payable in the twentieth (20th) Lease Year multiplied by the percentage increase in the CPI from the period beginning on the date which is three (3) months prior to the first day of the sixteenth (16th) Lease Year and ending three (3) months prior to the end of the twentieth (20th) Lease Year. (iii) The annual rent during the third (3rd) Renewal Term, which comprises Lease Years twenty-six (26) through thirty (30), shall be increased by (but in no event shall the rent decrease) the lesser of (A) an amount equal to the annual rent payable in the twenty-fifth (25th) Lease Year multiplied by 0.065 (i.e., increased by 6.5%), or (B) an amount equal to the annual rent payable in the twenty-fifth (25th) Lease Year multiplied by the percentage increase in the CPI from the period beginning on the date which is three (3) months prior to the first day of the twenty-first (21st) Lease Year and ending three (3) months prior to the end of the twenty-fifth (25th) Lease Year. (iv) The annual rent during the fourth (4th) Renewal Term, which comprises Lease Years thirty-one (31) through thirty-five (35), shall be increased by (but in no event shall the rent decrease) the lesser of (A) an amount equal to the annual rent payable in the thirtieth (30th) Lease Year multiplied by 0.065 (i.e., increased by 6.5%), or (B) an amount equal to the annual rent payable in the thirtieth (30th) Lease Year multiplied by the percentage increase in the CPI from the period beginning on the date which is three (3) months prior to the first day of the twenty-sixth (26th) Lease Year and ending three (3) months prior to the end of the thirtieth (30 th ) Lease Year. (v) The annual rent during the fifth (5th) Renewal Term, which comprises Lease Years thirty-six (36) through forty (40), shall be increased by (but in no event shall the rent decrease) the lesser of (A) an amount equal to the annual rent payable in the thirty-fifth (35th) Lease Year multiplied by 0.065 (i.e., increased by 6.5%), or (B) an amount equal to the annual rent payable in the thirty-fifth (35th) Lease Year multiplied by the percentage increase in the CPI from the period beginning on the date which is three (3) months prior to the first day of the thirty-first (31st) Lease Year and ending three (3) months prior to the end of the thirty-fifth (35th) Lease Year. (vi) The annual rent during the sixth (6th) Renewal Term, which comprises Lease Years forty-one (41) through forty-five (45), shall be increased by (but in no event shall the rent decrease) the lesser of (A) an amount equal to the annual rent payable in the fortieth (40th) Lease Year multiplied by 0.065 (i.e., increased by 6.5%), or (B) an amount equal to the annual rent payable in the fortieth (40th) Lease Year multiplied by the percentage increase in the CPI from the period beginning on the date which is three (3) months prior to the first day of the thirty-sixth (36th) Lease Year and ending three (3) months prior to the end of the fortieth (40th) Lease Year. (c) Net Lease. Tenant acknowledges and agrees that it is intended that this Lease will be, except as otherwise expressly stated herein, a completely “net lease” to Landlord, and that Landlord is not responsible for any costs, charges, expenses, and outlays of any nature whatsoever arising from or relating to the Premises, whether arising or accruing prior to or during the Term of this Lease, including, without limitation, the Improvements, or the use and occupancy thereof, or the contents thereof or the business carried on therein, except as may be otherwise expressly stated herein. Tenant shall pay all charges, impositions, costs, and expenses of every nature and kind relating to the Premises arising or accruing prior to or during the Term of this Lease, except as herein expressly provided to the contrary. Tenant covenants and agrees that the Rent to be paid hereunder shall be, except as otherwise expressly provided herein or permitted by law, paid without off-set or deduction. Landlord shall have the right to accept all Rent and other payments, whether full or partial, and to negotiate checks and payments thereof without any waiver of rights, irrespective of any conditions to the contrary sought to be imposed by Tenant. The Rent for any partial month shall be prorated based upon the number of days in said month. Notwithstanding the foregoing, Tenant shall not be responsible for any costs, charges, or expenses pertaining to Landlord’s organizational overhead, the financing or refinancing of the Premises by Landlord. (d) At such time as the annual rent is adjusted in accordance with subparagraphs (a) and (b) above (i.e., every five (5) years), Landlord shall provide Tenant with at least thirty (30) days prior written notice of the amount of the new Rent and shall provide Tenant with Landlord’s calculation of the new Rent (which shall be made in accordance with the provisions of subparagraphs (a) and (b) above). The annual rent payable during the Base Term and Renewal Terms as so calculated shall be payable in monthly installments equal to one-twelfth (1/12) of such amount. If the manner in which the CPI is determined by the Department of Labor shall be substantially revised, an adjustment shall be made by Landlord and Tenant, acting cooperatively with each other, for the purposes of making adjustments in annual rent as above provided so as to produce results equivalent as nearly as possible to those that would have resulted if the CPI had not been so revised. If the CPI shall become unavailable to the public because publication is discontinued, or otherwise, Landlord and Tenant shall agree to a substitution therefor with a comparable index based upon changes in the cost of living or purchasing power of the consumer dollar published by a governmental agency, or, if no such index shall then be available, a comparable index published by a major bank or other financial institution, a university, or a financial publication of multi-state or national circulation mutually acceptable to Landlord and Tenant.